Shield: Or, issuing from base a pile gules. In dexter chief an eagle sable erased, eyes argent, beaked of the second. 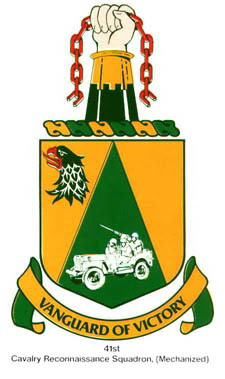 Description: The yellow of the shield is for the Cavalry. The red pile represents the tip of a spear in recognition of the reconnaissance nature of the unit. It also honors the contact of the unit with elements from the 2nd Armored Division at Houffalize, Belgium to complete the entrapment of German units, represented by the black eagle, during the Ardennes Campaign of World War II.